LARRP Steering Committee member Healthright 360 currently has over 100 jobs in the Los Angeles area. Long-time LARRP Steering Committee member Michael Graff-Weisner, Chrysalis VP of Strategy & External Relations, announces search for a new position at Chrysalis, Government Relations Manager. Working closely with him, this new position will actively represent Chrysalis in the community – regularly attending meetings, events, and conferences. They will build relationships with leaders in homeless services, workforce development, reentry services / criminal justice reform, and social enterprise, in order to advance Chrysalis’ mission. Over 2 dozen positions were posted in March for a wide range of human services positions, including for program managers, administrative assistants, drivers, mental health coordinators, community health workers, and Controller. Joe Paul Jr., Director of Workforce Programs joined the LARRP Steering Committee in March. To see a full list of open positions with Shields, click here. LARRP member organization VOA is looking to fill over 100 positions! VOA has dozens of openings for case managers, housing specialists, monitors, and outreach workers, as well as clinical directors, program managers and job developers. Do you see yourself giving back to the community, making a meaningful difference in impacted people’s lives, helping to end homelessness and keeping people out of the revolving doors of LA County jail? If so, there may be the right job for you here. 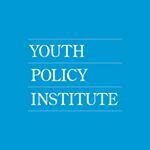 The Urban Peace Institute (UPI) is seeking a highly qualified Community Engagement Manager to support our successful place-based initiatives and community engagement strategies, which include directing leadership development trainings, school safety collaboratives, maintaining partnerships with community organizations and facilitating neighborhood-level stakeholder groups in South Los Angeles. Operating since 2000 within Kings County, CA, Champions seeks to serve those community members afflicted by social and emotional issues, family dysfunction, substance use, mental health, and criminal justice involvement. The Career Specialist/Peer Navigator for Project imPACT will work as part of a team to provide employment services to formerly incarcerated individuals as part of PACTeam model to prepare clients for careers. 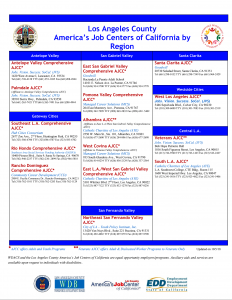 Project imPACT serves the San Fernando Valley region through YPI's Workforce Development Department, providing employment services for formerly incarcerated adults. 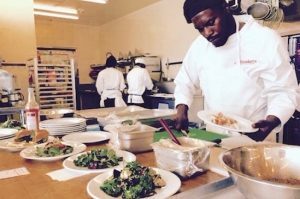 The St. Joseph Center's Culinary Training Team would like to share its new 2019 class dates for those who have clients that are interested in getting an education in the food service industry. Please see the new updated flyer along with additional information about their program. 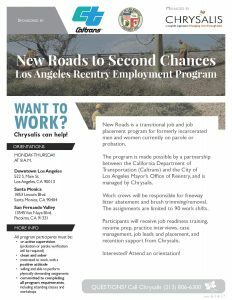 Chrysalis is looking for workers for New Roads, a transitional job and job placement program for formerly incarcerated men and women currently on parole or probation. The program is made possible by a partnership between the California Department of Transportation (Caltrans) and the City of Los Angeles Mayor’s Office of Reentry, and is managed by Chrysalis. Chrysalis is a job preparation agency designed to help individuals find, get, and keep a job. There are great job opportunities for Staff Analyst, Health positions within Whole Person Care-Los Angeles, as well as Staff Analyst series positions in our Office of Diversion and Re-entry, Housing for Health, and Substance Abuse Prevention and Control programs. These are great opportunities for individuals to work on mission-driven teams tackling some of the most challenging issues we face in Los Angeles. There is an exam/bulletin pending release very soon, and we wanted to see if we could get you to do some recruitment on behalf of our programs. People who apply and land on the list will have opportunities across programs, but for WPC-LA, we've pulled together a 2-page handout describing available positions. The following positions are available and will serve as the Capacity-Building and Collaboration Team for the Whole Person Care Program. 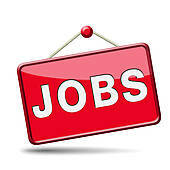 Knowledge of and experience using the Community Health Worker/promotor/a modelPlease carefully consider and refer possible candidates for these positions, and disseminate this email widely. An internal application and review process will be conducted in parallel to the County hiring process; successful candidates may be brought on either as contractors or as County staff. Next meetings: 9am-11am on 4/24. Check Hope Page for location. We will notify everyone if we are meeting in May closer to the date. Contact us to attend the next meeting, and to join our email list. Identify entrepreneurial opportunities to improve and increase employment readiness and job placement for formerly incarcerated or convicted people in LA County. • An additional penalty of up to $120 to the Employee and up to $50 to the City for each day that either violation occurred or continued. 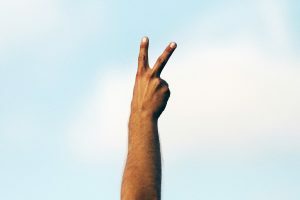 • In cases of retaliation, the Employee may be entitled to reinstatement and trebled the above. An aggrieved Employee may file a civil court action. Brookings has come out with a new report on occupational licensing. 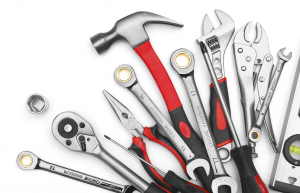 Occupational licensing - the legal requirement that a credential is obtained in order to practice a profession—is a common labor market regulation that ostensibly exists to protect public health and safety. However, by limiting access to many occupations, licensing imposes substantial costs: consumers pay higher prices, economic opportunity is reduced for unlicensed workers, and even those who successfully obtain licenses must pay upfront costs and face limited geographic mobility. In addition, licensing often prescribes and constrains the ways in which work is structured, limiting innovation and economic growth. Employment changes lives. Success is possible. We would like to share some of those success stories with you. Prior to accessing services in the community, Ricky lived life in the fast lane. He faced huge barriers in his job search; limited work experience, a felony conviction, and a large employment gap. He felt lost, and did not know how to explain these barriers to an employer. Despite his barriers, Ricky was determined to succeed. Click here to read Ricky’s story. “I grew up in Southeast Los Angeles where three generations of my family lived and began using drugs and alcohol at age seven. My father was a heroin supplier to the East Los Angeles area, and was either in prison or just never home. I left home when I was 17; I had been abused by my stepfather and had been using drugs for about 4 years. I ended up in Hollywood about a year later with no money and no place to live in 1977. I met many people involved with drugs and began using them myself. I spent the years between 1985 and 1999 going in and out of prison, being homeless and addicted to drugs.